Painting of a simple gold chalice and host (with the emblem "IHS") on a red ground framed in gold. 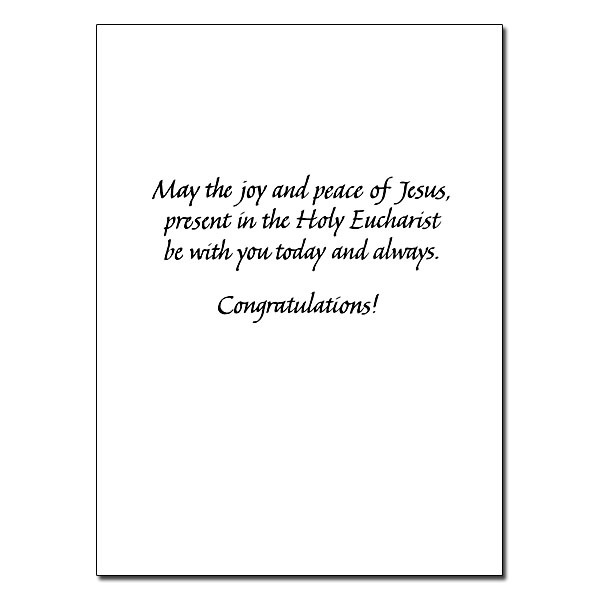 Rejoice with those receiving their First Communion. Tri-fold card sized to hold US paper money. 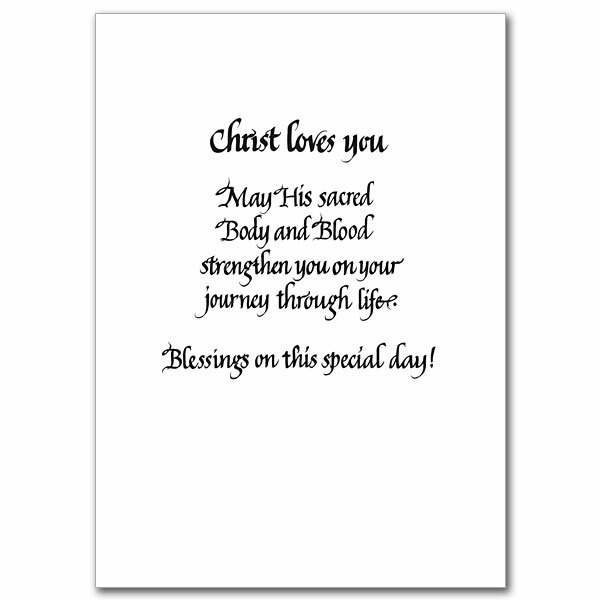 Card size 3 3/4" x 7 1/4" with matching envelope. Printed reproduction of a stained glass window image of a chalice and host with shocks of wheat in the foreground. The background is a ghosted image of the stained glass window with a pink tint to the image. Illustration of 12 children surrounding Jesus at table as he offers them his sacred Body and Blood. The children are arranged in poses reminiscent of Leonardo Da Vinci&apos;s famous "Last Supper" painting. Watercolor image of a white cross on a blue colored chalice. Wheat and grapes surround the cross. The lettering appears at the top and bottom in Roman capitals and is framed with a thin blue line. 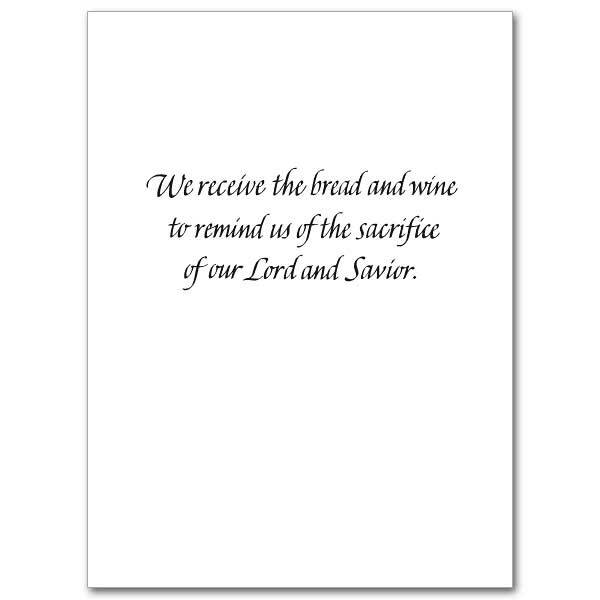 Rejoice with those receiving their First Communion. The cards measure 5.93" by 4.38". Rainbow pen and ink of dove and chalice with host on left top and right bottom (respectively) corners and blue and green calligraphy in middle of white card. Painting of Christ presenting a chalice and host. He is dressed in red and white robes. Brilliant light emanates from behind his head. Illustration of a priest dressed in white vestments distributing communion to five chldren of different ethnic backgrounds. 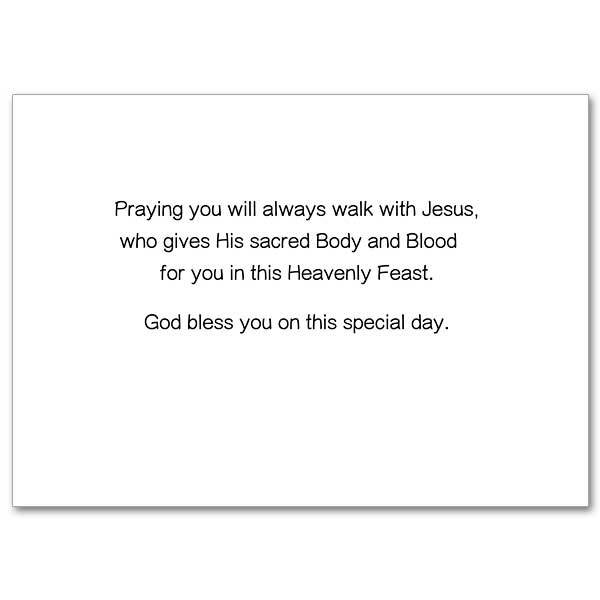 Bordered fine art painting of Christ presenting the sacred host at table. Close-up photo of the hand of a priest distributing the host to a communicant and in the background, a deacon distributing the cup. 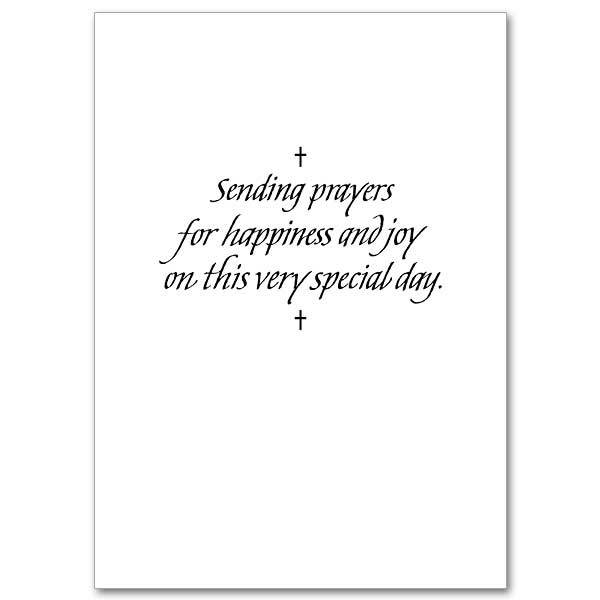 The same image is ghosted in the background of the card. 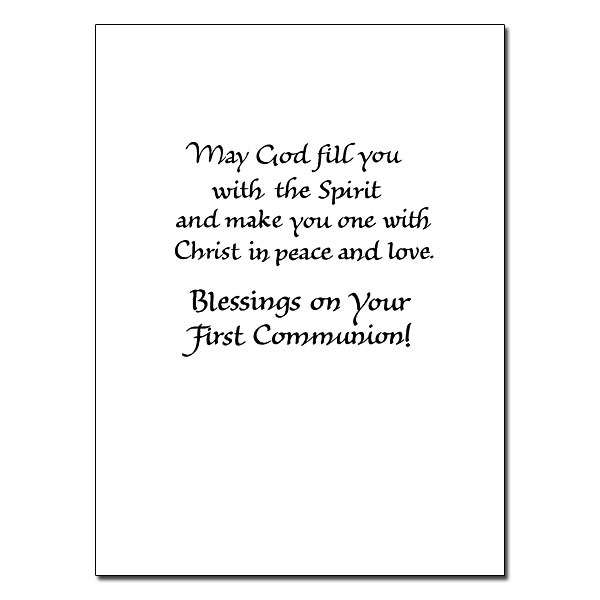 (Gold-stamped) Rejoice with those receiving their First Communion. The cards measure 5.93" by 4.38". This card was formerly CA1664. Gold colored chalice with foil accents: IHS symbol, cross and detail on the node surrounded by three shafts of wheat. The background is of various shades of blue with white lettering. Border at left with the following symbols: cross, dove, chalice and host, grapes and heart on a lime green ground with purple borders. At the right is a text panel with lettering in green on a yellow ground. 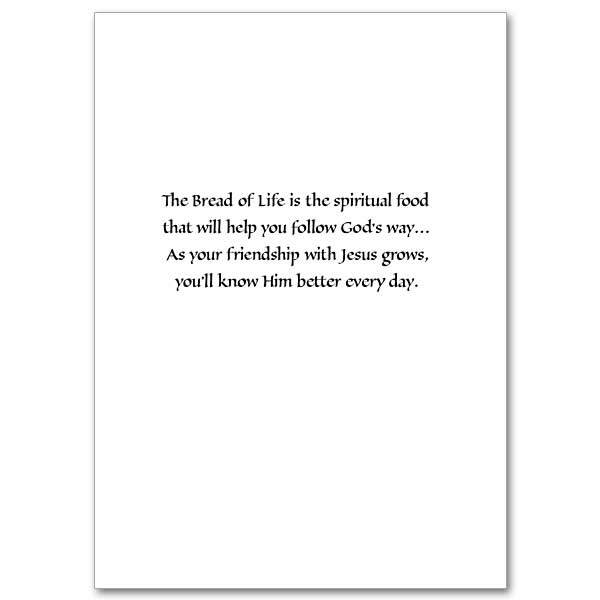 Rejoice with those receiving their First Communion. 5" by 7". Illustration of a gold chalice with paten and host on a golden, variegated background. The lettering is in black on a solid copper side panel and there are copper foil accents which enhance the chalice design. Painted illustration of Jesus distributing communion to four children of various ethnic background. Jesus is dressed in a white tunic with a purple outer garment. 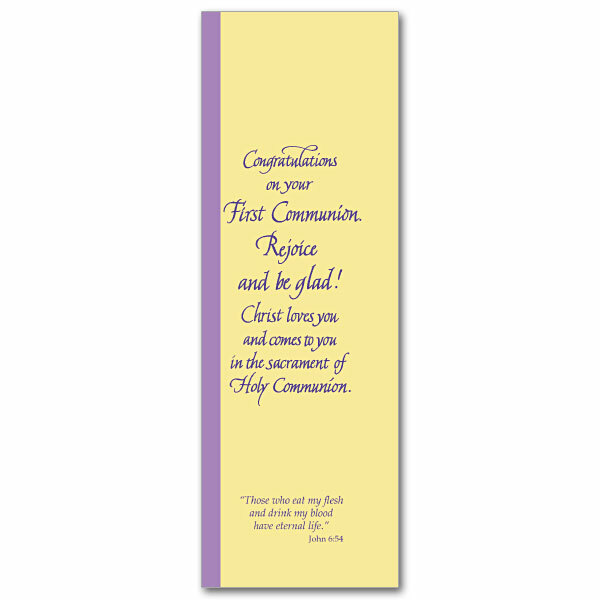 (Gold-stamped) Rejoice with those receiving their First Communion. The cards measure 5.93" by 4.38". This card was formerly CA6636. Watercolor of chalice and host with grapes and leaves in background. 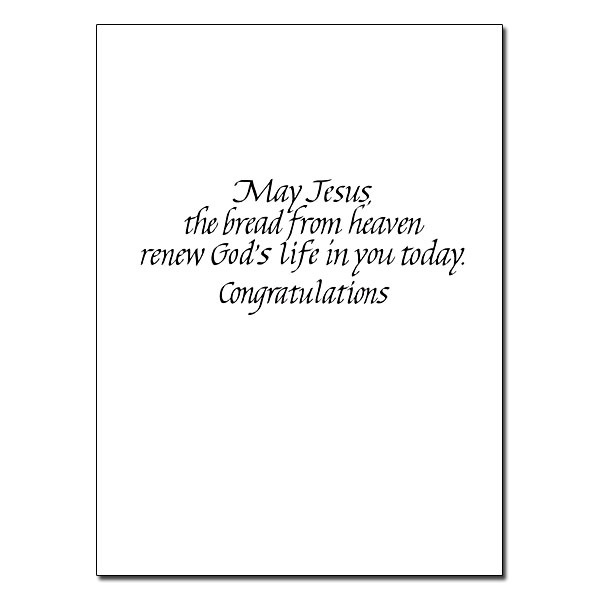 Rejoice with those receiving their First Communion. 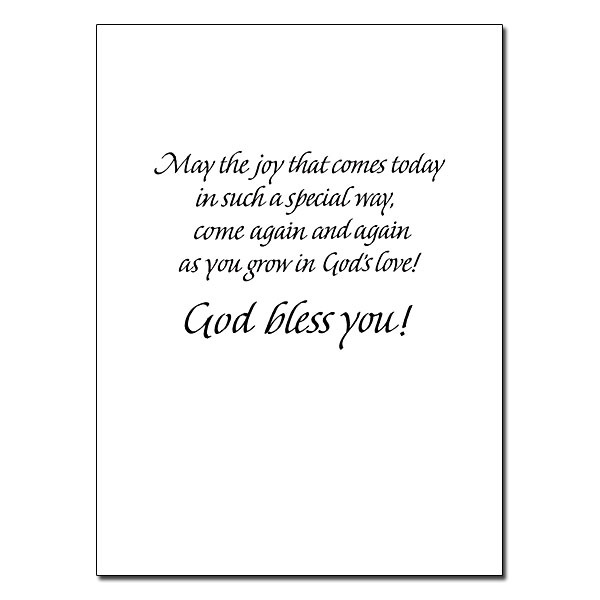 5" x 7" card with matching envelope. 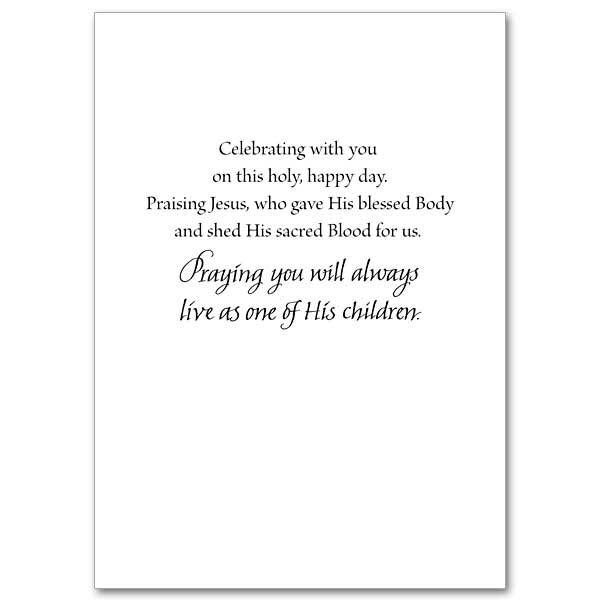 Foil stamped calligraphy Chalice, host, book with rosary, floral border. 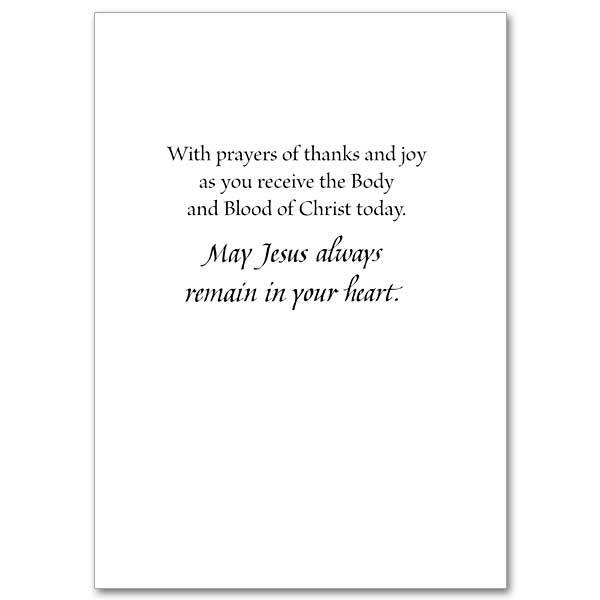 Rejoice with your granddaughter on her First Communion. The cards measure 5.93" by 4.38". Chalice and Host in a panel of magenta and blue on a beige textured background. 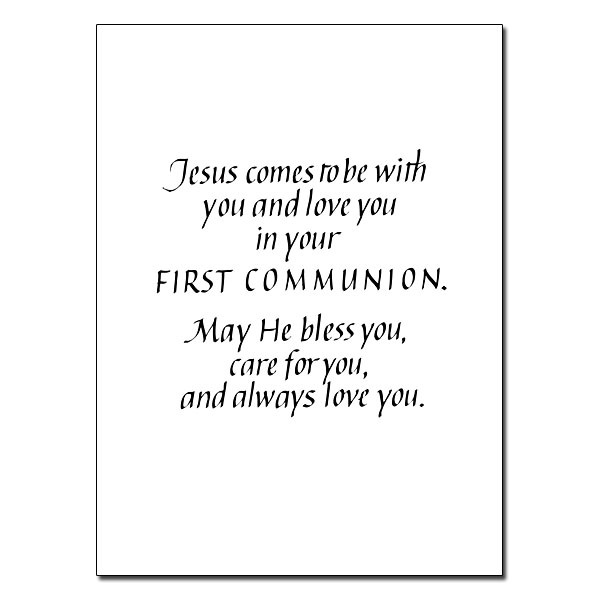 Rejoice with those receiving their First Communion. 5" by 7". Painting with Host, Chalice, candles, Bible and flowers Rejoice with those receiving their First Communion. 5" by 7".